What is the source and summit of the Catholic faith? The Eucharist. And, according to author Flannery O'Connor, when a fellow writer said it was a beautiful symbol: "If it's a symbol, to hell with it." Bishop Robert Barron is busy traveling, shooting new episodes for his "Catholicism: The Pivotal Players" series, including one on O'Connor, whose sometimes hard-edged tales touch on the deepest recesses of the human heart and the ever-present chance of redemption. In the clip below from the O'Connor episode, posted Aug. 14, Barron can be seen in the rose gardens at Yaddo, an artist's colony and retreat near the famed Thoroughbred racecourse in Saratoga Springs, in upstate New York. It includes the above quote and more. As demonstrated by the exodus of many disciples as soon as Christ started talking about the true nature of the Eucharist, it's a hard thing to accept: that the Son of God can be fully present -- Body, Blood, Soul and Divinity -- under the appearance of bread and wine. In Family Theater Productions' online series "Catholic Central," we consider the Eucharist to be so important that we dedicated two episodes to it. It's a serious subject, and host Kai (Kaiser Johnson) and Libby (Elizabeth Slater) treat it as such, but with the lighthearted touch seen throughout the show (which is still releasing new episodes regularly). Catholics love Mary and the saints, but Jesus is the undisputed Lord, Savior and King, who gives Himself to us at every Mass, in the humblest and most miraculous of ways. 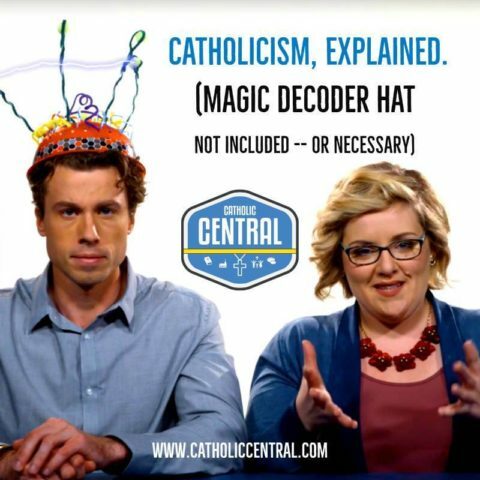 Enjoy all the episodes at CatholicCentral.com.